A tiny girl in a pretty dress stands up before a large audience at a master class. She raises her small violin to her shoulder and lifts the bow to the string, preparing to play in perfect form. She then plays Twinkle with every note out of tune. "Susie, I'm George, the third finger. Did I go down on the tape?" Susie, rather bewildered, admits, "I don't know!" "Well, would you watch us?" Starr says. "If you watch us, we promise to go down on the tapes!" "This is George, how did we do?" Susie answers a little shyly, "Good." "Oh come on! Don't you think we did better than that?" Starr asks. Starr shared this story last Sunday with a group of about 20 Suzuki teachers at a workshop at Lonie Bosserman's studio in Orange County, Calif. He was speaking about how to help students become their own teachers. I agree with Starr about who is in charge of Susie's fingers: it's Susie. Sometimes this gets lost in the"Suzuki triangle," which includes at its points the student, teacher and parent. The parent is considered the "home" teacher, which is certainly helpful in teaching very young children. But with both the parent and teacher instructing the student, the student can become disengaged. "I don't like the Suzuki triangle," he said, challenging one of those core Suzuki beliefs while still embracing it. "We Western teachers need to develop the creative abilities of our students and teach them to be their own teachers." Starr might be a believer in Suzuki's philosophy, but he's also a man of his own ideals. At once a violinist, teacher, conductor, composer and teacher trainer, Starr has had a profound influence on the Suzuki movement. In particular, he has contributed significantly to improving Suzuki teachers' ability and willingness to teach music reading. The Suzuki method, which relies heavily in the beginning on rote learning, was criticized (and still is) for a deficiency in teaching children to read music. Starr has done much to change that. Not only has he been an advocate for the teaching of music reading, but he and Constance Starr also have written much of the literature Suzuki teachers use for teaching it. Among the arrangements Starr wrote are Adventures in Music Reading, 77 Variations on Suzuki Melodies, Delightful Duets, Rounds and Canons, Strings Around the World Folk Songs of the USA, Taka Taka Polka and Twenty Six Composers Teach the Violinist. He also wrote several important books about the Suzuki method, including "To Learn With Love," written with his wife, and "The Suzuki Violinist." "I didn't bring out my books for years," Starr said. "I didn't know how to do it, how it would be received. I realized, though, we've got to teach them some theory." Starr admits that he is as disturbed as any traditional teacher by a student who can play a fantastic Vivaldi concerto, but who cannot read music. Repetition, he realized, is the key to good reading. "You don't read much, you just recognize," Starr said. "The key to learning reading is to build a huge memory bank of musical patterns." Most recently, Starr bought a biofeedback machine to help him figure out how much energy the body uses for certain motions used in violin playing. He found out that playing the "motorcycle stop-stop" rhythm with only the weight of the bow takes 15 to 30 microvolts, while playing the same rhythm while pressing hard on the pinkie and thumb takes 60 or more microvolts. "Basically it takes twice as much energy for a bad tone," he said. So one of his recent projects is to determine the most relaxed way to play the violin, and to teach it from the beginning. "Dorothy Delay said, 'It doesn't take much energy to play the violin,'" Starr said. He also told a story of a child asking Itzaak Perlman, "What do you think about when you practice?" Perlman responded with one word: "Relax!" Based on his biofeedback experiments, he is throwing out some of the early bowing exercises for the small children like "Up Like a Rocket," because they use about 90 micrvolts of energy in the fingers, which is very high. One of the reasons I wanted to see Starr is that I never did get to meet Shinichi Suzuki, and he is someone who knew him well. His stories about Suzuki confirmed once again for me that Suzuki was an innovator, and that we should be, too. We should not be afraid to be shaped by our experiences and our environment, and to follow our instincts. One lovely image Starr left me was of Suzuki, during the days when he was courting his soon-to-be wife, Waltraud. When they married, he told her, they would move to Switzerland. Waltraud spoke German, and Suzuki spoke Japanese. His love letters to her were postcards. There was no Japanese, no German; he just drew pictures of the mountains. Their dream together. They never did make it to Switzerland, for all the woe the world was going through during those years. But I could see the grain of his idea in those pictures. When he dropped his bow during quartet rehearsal and said in amazement, "All Japanese children speak Japanese!" he did so because of his struggle to learn German, and Waltraud's struggle to learn Japanese. The members of his quartet put their instruments down and talked for three hours after his statement. If all children, all children, can learn their mother tongue, what else can all children learn? Many years and thousands of students later, Suzuki's faith in children and their potential remained unshaken. "After all these years," Suzuki said, "I am still astonished when I think of the abilities of all children, and saddened when I think of all the children whose abilties are never developed." Equally important is the fact that teachers, Suzuki or not, need to stay faithful to what they are teaching and the children they are teaching it to. We aren't teaching a method, we're teaching children, and we're teaching music. Suzuki just gave us a little more faith in the process. "Once you start using your imagination," Starr said, "you will start coming up with all kinds of clever ways to get in the back door of children's imaginations." Oh woe, 2006! It rained on our parade! Here I sit, in my little Pasadena home, one block away from the parade route for the annual Rose Parade, with torrents of rain showering the roof. The parade usually takes place on New Year's Day. Because the holiday fell on a Sunday, though, the parade was scheduled for Jan. 2. Local lore has it that ever since the 1893 agreement with local churches to never have the parade on a Sunday, Someone Upstairs has made sunshine for the Rose Parade nearly every year. It's only rained nine times in more than 100 parades. Make that 10. Weather forecasters had been painting this distressing scenario for a good week. While many chose to be in denial about the weather, I chose to be in denial about the Rose Parade. I lived in Omaha, Neb. for four years. I respect Someone: Mother Nature. But it's not easy to be in denial about the Rose Parade when it all takes place a block away from one's house. For a month now, elaborate stadium seating has been going up along Colorado Boulevard, a street that holds the addresses for much of my life's activities: the Target I go to, my favorite bookstore (Vroman's), my grocery store, car repair place, etc. Somehow I managed to find back ways to get to all my normal places, without even having to see the street itself. We managed to get our one taste of the Rose Parade last week, when we took the children and some friends to the Rose Bowl, where hundreds of volunteers were decorating floats. It was a lazy and warm mid-day, the low winter sun smiling on hot dog and kettle corn stands, with people milling slowly about. The floats stood in large tents and a hangar, with entire rooms full of all kinds of flowers to be applied as decoration. The rule is that everything decorating the outside of each float is some kind of plant, so they are decorated with all flowers, seeds, leaves, etc. It didn't rain yesterday morning. It started in the afternoon. We didn't do the normal drive up to the street corner, just to see everyone camping out for the parade. Instead, we took the plants in. The kids stayed up later than usual, occasionally padding into our room to ask, “What are we doing tomorrow?” They were not comfortable with the “if, then” scenario, but they heard it again, “Well, if it's not raining too much, then we'll go up to the parade. But if it's pouring...” We tended to trail off, here. Not go? Hmmm. Before going to bed late last night, Robert and I checked weather.com for the scenario. It showed a 60 percent chance of rain for the current hour, then increasing through the night to a 100 percent chance for the hours between 6 a.m. and noon. A good gullywasher may not seem like much cause for concern to most people in the world, but I've lived in Pasadena long enough to understand that it can feel like Armegeddon here. After a good four months of very little weather, just a whiff of a breeze here and a spitting of rain overnight there, a real downpour is downright alarming. I awakened at 6 a.m., to find 100 percent rain, unable to sleep as I channelled the collective disappointment of this entire town. Here at 7 a.m. though, it seems like the rain is slowing a bit. Will the show go on? My five-year-old son just got up, climbed onto my lap and asked, "Will da sun come out for da Rose Parade?" Indeed, will the sun miraculously show for three hours this morning? Will the show go on? I guess it's time to dig out the umbrellas! 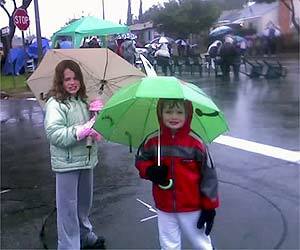 Well, we dug out the umbrellas, and like good Pasadenans, we headed bravely toward the throng. Every year now for four years, we have joined the Honowitz family at their legendary 10 yards of sidewalk, which they go to great pains to reserve every year since the dawn of time. So we slogged forth, wearing rain boots, coats, etc. My boots, really nice "waterproof" ones that lace all the way up to my knees, kept me warm until we got a quarter mile away from the designated spot. Then they reached saturation point, apparently, and my feet were soon completely soaked. My kids were soaked, too. When we reached our friends, they showered us with happy greetings, "You guys are idiots, too! Can you believe it? What are we doing here!" "Mom, MOM. The Emperor is completely buck-naked. Get us out of here, the pneumonia is setting in. NOW!" This is a picture of us, bailing. So we saw a bit of the parade as we headed home. We threw off our clothes, took warm baths, then settled down in front of the T.V. with hot chocolate and kettle corn to watch the parade. Like everyone else in the country!